It’s Follow-Up Friday: Thanksgiving Answers edition! And today, I’m posting the answers to last week’s Thanksgiving Slide-O-Gram puzzle! 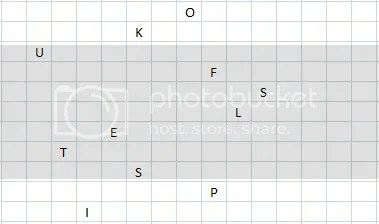 Using the given letters, place the eleven Thanksgiving words and phrases below into the diagram above, one per row. 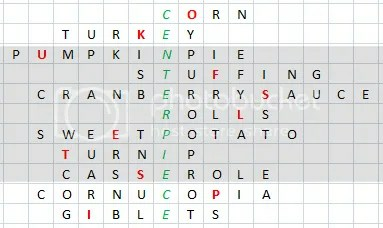 When all the words and phrases are entered properly, one of the columns reading down will spell out an 11-letter word that is related to Thanksgiving. So let’s take a look at the completed grid! Our bonus answer tying the word list together was, appropriately enough, CENTERPIECE. How did you do? Let me know in the comments below!